A farmer and trucker from upstate New York bought the Islander this week for $23,600, placing bid 58 on Ebay Monday for the vessel that ferried Islanders to and from the rest of America for over fifty years. The auction looked like it might be a humiliating episode with the old girl fetching a starting bid of just $10, with offers crawling to a few thousand in the first days. But after a flurry of late offers from a total of 19 bidders it finally went to Donald Slovak of Valatie, N.Y. The price is a significant deal compared to the $500,000 which the Governors Island Preservation and Education Corporation paid the Steamship Authority for the ferry back in 2006. She proved a lemon for the corporation, the board governing a 172-acre stretch of land east of lower Manhattan and a few hundred yards north of Brooklyn. The organization had planned to use the ferry as a back-up vessel for the tiny journey made by thousands of tourists to the island during the summer months. But following a six-month inspection, they declared their purchase an unseaworthy rust bucket. The Islander, which has a capacity of 770 passengers and 47 vehicles, was acquired in 1950 for $1,010,343. Jon Myers, a spokesman for the Governors Island corporation, said the repair would run into the millions. The organization decided to put it up for sale instead. Mr. Slovak operates a fruit farm in Valatie and Slovak Auto Transport, a trucking company headquartered in Shaddock Landing, New York. He made the required $3,000 deposit for the ferry earlier this week, and must arrange pick up of the ferry from New York harbor. Not a commercial ferry operator, Mr. Slovak, who could not be reached yesterday for comment, may well decide to sell the Islander off piece by piece for scrap. The Islander now joins other Steamship Authority ferries that have been put out to pasture — or the ocean-going version of such — and eventually met with untimely ends. The Nobska, the last coastal steamer in America that operated on the Vineyard run between 1925 and 1973, finally went under the wrecking ball at the Charlestown Navy Yard in June of 2006. After she went off the Vineyard run, the Nobska was a restaurant in Baltimore for awhile, and then was the subject of a long and ultimately unsuccessful campaign to restore her as a museum ship. The ferry Naushon, the last of the SSA steamers and a favorite old vessel among Islanders with her elegantly rounded hull and grand staterooms, left for a new life as a casino ferry in 1989 and has not been heard from since. The ferry Schamonchi, a somewhat homely girl that was built in Maine in 1978 and ran between New Bedford and the Vineyard as a passenger ferry for more than 20 years, left for New York city in July of 2005 after the SSA had bought and decommissioned her. The Schamonchi was bought by Caribbean Shipping and Marine Services of Flushing, N.Y. 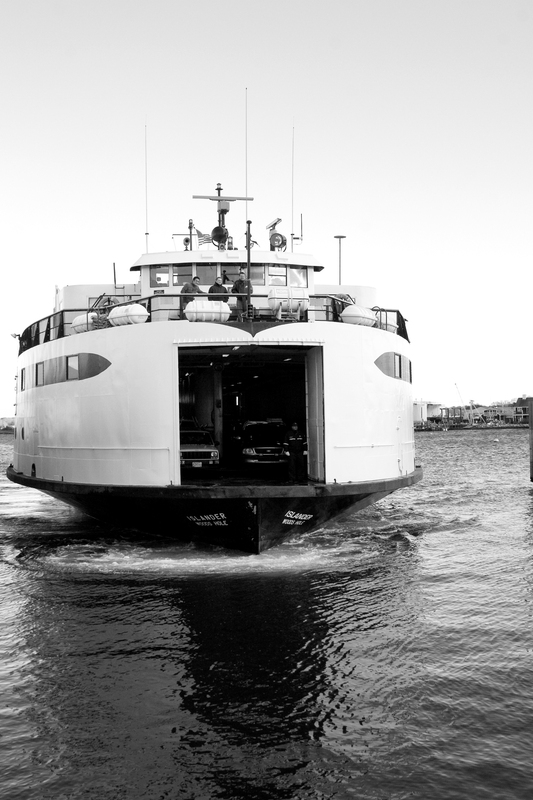 The company paid a little over $100,000 for the ferry and had plans to refurbish the ferry and use it as a party boat. But this winter the Schamonchi turned up in New York Harbor as someone’s home — The New York Times ran a story about it. And so it seems that old ferries never really retire; instead they just fade away.